Welcome to the Faculty of Law – UiT The Arctic University of Norway! Beautifully located in Tromsø, which is a city placed at the coastline of Northern Norway, you find the Faculty of Law, UiT the Arctic University of Norway. UiT The Arctic University of Norway is the largest institution for higher education and research in Northern Norway, with approximately 16 000 students. Around 800 of them are studying at The Faculty of Law. Tromsø excites both city addicts and nature freaks, and provides you with opportunities to enjoy every second of the time you spend here, also outside of the University. The North Norwegian nature is ideal for many outdoor activities such as hiking, climbing, surfing, skiing, snowboarding, dog sledging, kayaking, fishing etc. 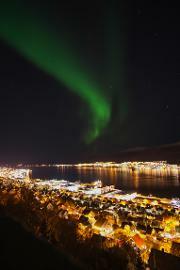 Tromsø is therefore a splendid starting point for nature-based experiences all year round! The city of Tromsø, placed in-between these impressive nature surroundings, is also as much pulsating as its surroundings. Events like RakettNatt Music and Arts Festival, Tromsø International Film Festival, the Northern Lights Festival, Insomnia Festival as for plenty other cultural happings, gives you the impression of living in a tiny version of a big city. As a student here, you get access to a multitude of student activities hosted on and off campus. For example, in the city you find the student-run cultural center “DRIV” hosting concerts, quizzes etc., and the student sports center “KRAFT” that offers a broad variety of indoor sports, is located not more than a 3 minutes’ walk from the University”. Promising young researchers within the field of International Law can now apply for the prestigious Marie Skƚodowska-Curie individual fellowship at JCLOS – uniquely located in the Arctic urban research city of Tromsø. Be a Master of the Sea! The unique LL.M. in Law of the Sea, offers a pure focus on the Law of the Sea in the context of Arctic legal perspectives and issues. Deadline for Nordic applicants is 15 April.